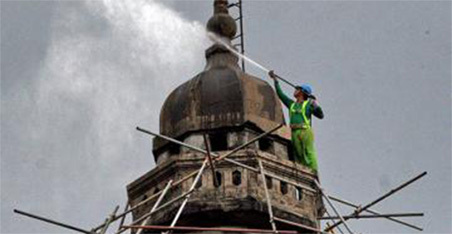 Further to the major structural repairs and renovations of Manila Cathedral, which were blessed in a proper ceremonial rite during its 44th anniversary in December 2002, more construction projects have been undertaken. These are efforts of the Rector in connection with a continuing “facelift program” for the Cathedral until it becomes fully furbished by the time it celebrates its Golden Anniversary in 2008. Rehabilitation of chilled water piping insulation (supply and return). Repair and repiping of comfort rooms inside and outside the Cathedral. Repiping and relocation of main water line outside the Cathedral office. Plumbing works on the janitors’ room. Relocation of floor drain and installation of piping drain of aircon units. A/C ductworks for Unit No. 1 and No. 2. Reinstallation of AHU 1 and 2 at the roof deck. Renovation of ground floor office, involving carpentry, masonry, painting, wood parquet works, and hauling of debris and waste materials. Electrical works on emergency lights, alarm bell, Internet, telephone, convenience outlet, and door switch. Transfer of electrical wire, exhaust fan, wall fan, and PBX cable. Installation and rewiring of aqua blue ropelights to the metal cross. Installation of steel gate at the Cathedral side; widening of east wing ramp. Installation of the Papal Coat of Arms at the façade and at the Dome area of the Cathedral. Installation of iron stairs for the videographers and photographers. Renovation and water-proofing of inside concrete gutter. Installation of two steel doors and two window grilles at the janitors’ room. Installation of Hi-bay lights and organ spotlights at the choir loft. Installation of the church’s welcome signages. Rehabilitation of the tower bells and giant clocks. Repair and renovation of the bell installation, including fabrication of three new clock counter weights and installation of new counter weight cables. Installation of new ropelights and painting of big metal frame. Plastering of damaged beam and widening of railings and enclosure of hand railings of the bell tower/belfry. Re-landscaping of the Cathedral Gardens. Construction of the dome of Our Lady of the Immaculate Conception at the Cathedral Gardens. Installation of lights and backlights for the dome of the Blessed Virgin Mary at the Garden. Improvement of the Episcopal Throne.